Taste testing activities are loads of fun; fun to set up, fun to taste test, and fun to watch reactions. All ages from very young up through grandparents can participate. Family members or kids and their friends. That is the great part with taste tests: you can customize them to fit your family and/or friends. You can make the activities as simple or as complicated as you want. Be sure to have your camera ready because there will be many Kodak moments. If your kids are teens, they will love posting their photos on facebook, Instagram, or Pinterest. One promise that they ALL must make is to keep all postings fun. At no time should anyone post something nasty on their social media about anyone else. Taste testing can be for dinner items. They can be part of the dinner that you serve or just a fun activity for after dinner. The food items that you can use to set up a taste testing activity are limitless. If you will have the taste testing activity after dinner, make the dinner a really quick and easy meal so the time can be spent doing the taste testing. Refer to last week’s article: Quick and Easy Meal Suggestions for ideas if you need help with super-fast dinner ideas. Usually the excitement of doing a taste test after dinner will provide loads of help for quick and easy cleanup, too. The key to having successful taste testing activities is for family and friends to be able to laugh, joke, and share. The great part about doing this is when your kids see how much fun this is, you will most likely get all sorts of volunteers to help set up a taste testing or food contest for the Friends and Family Activities! That is really the objective: to get your kids and family members working together as a team. The more they do together, the more they will talk among themselves, the better they will know learn to know each other. And, the anticipated end result is for everyone to learn the fun side of you so they will be completely comfortable talking with you about anything. You are limited to the items that you can provide for testing only by how creative you are. Try testing all sorts of foods by comparing them to each other. Have fun with foods by creating contests or just testing to find out who likes which items best. However, let’s start with basic taste tests. Get your kids to help you create rating or score sheets. For young children, the score sheets can be completed by putting colored circles in squares that show how much they did or did not like something that was tested. Another simple score sheet is at FoodandFun.org. An example of a score sheet for older kids is from Delmar Learning Organization. If your kids’ friends will be joining Taste Testing Events, get the cell phone number of everyone present so that you can text the photos to everyone. That also will ensure that you have a way to contact all of your kids’ friends. Just be sure to save them as your favorites by which child’s friend belongs to the number! Ask if anyone has any food allergies. You will create the wrong memories if you have to rush someone to the hospital! Your camera: you will get better photos if you skip using blindfolds so everyone can see each other. They will laugh at the faces that some will make. Be sure to mark the score sheet with the same number. No one will know what brand they tasted until after all the score sheets have been turned in. Score sheets that everyone can complete. Score sheets can be simple for the very young and more involved for everyone who will be taste testing who is older. You can create score sheets on your computer, or better yet – have your kids create the score sheets. Have some place where you can make a note of the winning item so that can be added to your regular menu. The list is endless of the items you can taste test: jams, cheese, pasta (dried versus cooked), and potato chips. What stuff do you have around home that can be used? No sense spending money. However, just in case you have no ideas, below is a list of fun taste tests from a variety of websites. Did you know that taste testing is this popular?!? Eat the Alphabet: Pick a letter of the alphabet and then find a variety of fruits or veggies that start with that letter. Examples may include: A = apples, apricots, almonds, avocado, etc. E = eggs, edamame, English muffins, eclair, etc. P = pears, pineapples, peaches, pickles, potatoes, etc. Varieties: different kinds of apples or berries, etc. Or broccoli served raw versus steamed. 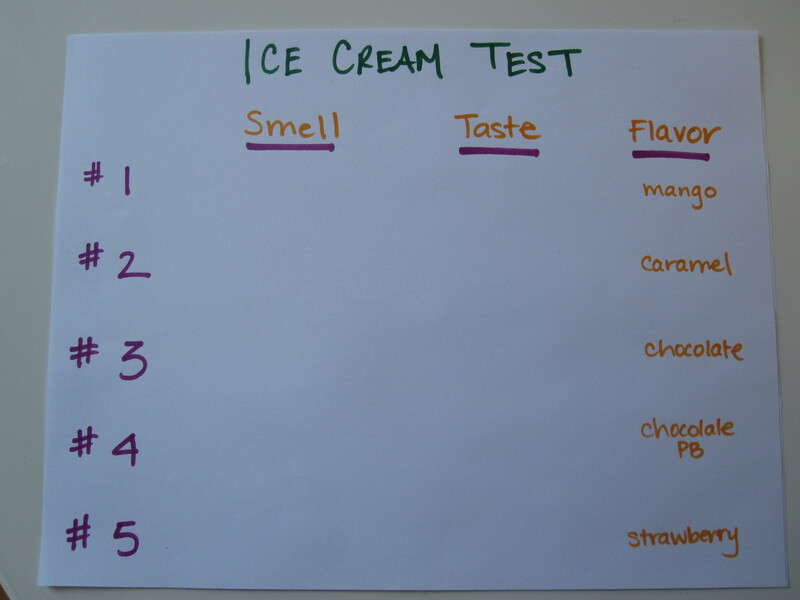 Create a “clue sheet” that has questions to answer so the kids can guess the foods that will be tested. Test Your Senses: You can make this as simple or as involved, depending on the age of the kids doing this. You can provide an illustration of the tongue to show what areas of the tongue taste Examples are from Planet-Science.com and AbundantMama.com. In fact, Education.com provides a test that will test the various parts of your tongue. Be sure your digital camera has backup batteries because you will get loads of photos from this contest! The contest is to see who can make the best mustache by using two different mixtures. Be sure no one has any allergies before starting. You will make the wrong kind of memories if you have to rush someone to the hospital because of an allergic reaction! Put 3 tablespoons of whipped cream. Mustaches can be made by dipping their finger into the whipped cream or trying to drink the whipped cream. Mix 3 parts vanilla ice cream with 1-part milk. That should make the “milk” thick enough so that they can “drink” the ice cream/milk solution to make their mustaches. When everyone has their 2 mixtures ready, let the games begin! Everyone should make their mustache, whether by dipping their finger into the mixture or drinking from the cup, making sure to get plenty on their upper lip. They must wait for everyone to make their first mustache and be photographed before cleaning off the mustache and making the 2nd mustache. Pictures should be taken of each person individually and also as a group. You can text all photos to everyone present. Phase 6: Planning Meetings for Friends and Family Events will be published on 8/24/2017. All of the previous articles have been about helping you to prepare for the first meeting with your family.